Buying food in Cyprus can sometimes feel quite complicated. Some newcomers are used to enormous American-style hypermarkets, which are now quite common in the UK and other Western countries. At the other extreme, people might be used to browsing extensive small market stalls to find fresh fruit and vegetables. To be sure, there are some reasonable sized supermarkets in Cyprus, and the occasional Saturday market. But the majority of locals do most of their food shopping by locals at smaller stores or mini-markets. There are also a variety of smallish discount grocery stores in each of the towns. They are like reduced versions of supermarkets, often with a label ‘Discount’ or ‘Express’. 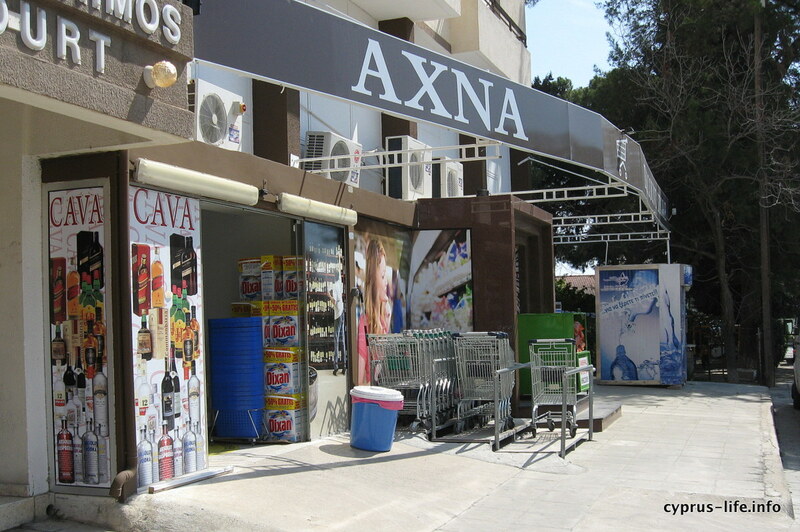 In addition there are still smaller general shops – known as kiosks or peripteros – in residential areas. These often selling postcards and magazines as well as basic foods. Their prices are not usually as good as the main supermarkets, but they are often open on Sunday mornings. Two very important types of food shop are the bakeries and the froutarias (greengrocers). 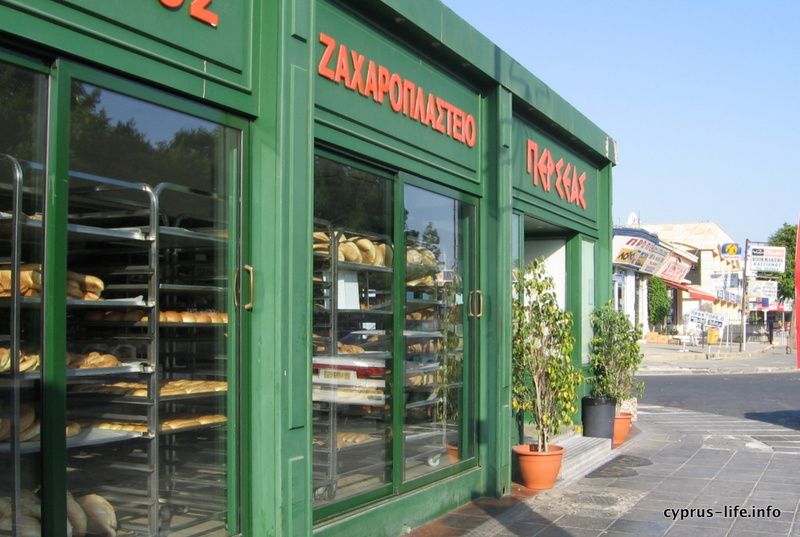 Freshly baked bread is an important part of the Cypriot lifestyle, and there are excellent bakeries in most main streets. They are often open for 24 hours per day, 363 days of the year. As well as several types of bread, pittas, rolls and cakes, bakeries typically have a refrigerated section. So they sell milk, cheese, ham and soft drinks, etc, although they tend to charge quite highly for these items. Still, if you have unexpected guests late at night, the bakeries are convenient. The only days they almost all close are Christmas Day and Greek Orthodox Easter Sunday. Froutarias are almost as prolific as bakeries, and also tend to sell refrigerated produce in addition to their wide range of fresh fruit and vegetables. Sometimes they sell other basic canned and packaged goods too. It’s worth trying out several fruit shops, since prices vary, as does quality. Many of them have special offers of the previous days’ produce in an outer section of the shop; these tend to be excellent value so it’s worth visiting your froutaria regularly, and fairly early. Their opening hours are not as extensive as that of the bakeries; they are closed on Sundays and most public holidays, and daily opening hours are around 7.00am – 6.00pm, with earlier closing on Wednesday and Saturday afternoons. Is food expensive in Cyprus? People often ask if it’s expensive to buy food in Cyprus. Obviously, one person’s idea of good value differs from another, depending on their expectations and background. Someone from an Asian or African country would probably find food very expensive in Cyprus, whereas someone from a Western European country would find some foods (such as fresh fruit and vegetables) quite good value. People from the USA used to find it reasonably priced, but with the dollar having fallen significantly against the euro, this is no longer the case. It also depends considerably on what kinds of food you want to buy. If you’re happy to shop around, to buy local seasonal produce, to use discount stores where possible, to cook everything from scratch and to take advantage of special offers, then you will find shopping much less expensive than people who buy imported ready-made goods, fruit and vegetables out of season, and only ever go to one supermarket. In 2014 we found that around 300-400 euros per month was more than sufficient to buy food and other groceries for two adults (and three cats), and do a fair amount of entertaining. But then we don’t buy any fizzy drinks, sweetened cereals or crisps; nor do we buy ready-prepared meals or jars of sauces. We buy most of our fruit and vegetables from a local fruitaria, and we make all our own bread, preserves and ice cream. However, note thatmany people spend considerably more than this on food. 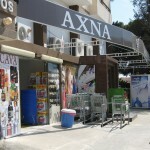 For information about larger stores, see the page on supermarkets in Cyprus. If you want to know about eating out in Cyprus, rather than buying food to cook, the page on restaurants in Larnaka may be of use.